what you see ain't necessarily what you get . The first task for the printmaker is to ensure that the computer knows how the monitor displays colors -- what sort of bias does the monitor have, does it shift colors to red, for example. I first create a monitor profile which loads up when the computer starts and shifts the color display to compensate for the monitor bias. A colorimeter is attached to the screen to periodically calibrate the monitor and update the profile. If this is done correctly, I know that I am seeing on the screen and registering in my brain what the computer is registering in its brain. The next requirement is to see what bias the printer has. I now make a printer profile -- not just one for the printer alone, I make one for each combination of printer, ink and paper. I use the same ink all the time, but I have 5 printers and use several different papers -- hence many profiles. To create one, I print out an image which is comprised of a series of colored squares. These squares have a digital signature, a numeric color value which is known to the computer (the values are built into the image file.) A spectrophotometer assesses the printed image and determines the difference in the color values between the intended colored squares and the resulting printed colored squares. The computer now knows what biases the printer/ink/paper combination has -- do the colors shift to blue, for example. 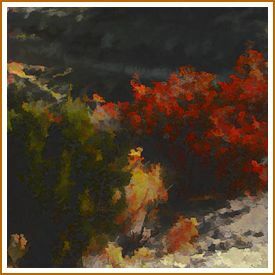 When I print the image, I impose the printer profile on my image file which subtly alters the colors to compensate for how the printer will interpret the colors. If all goes well, then, the image printed will be the same as the image on the screen. If all goes well..... I In reality, as I have discovered, the profiling is a good starting point, but it is not always wholly accurate. I find that with most images, adjustments of tone and contrast have to be made and with some images, particularly those with highly saturated but quite different colors, tricky changes have to be made. If I decide a printed green is too yellowy and correct it, I have also altered the oranges and made them too red. Balancing these hues is rather like one man trying to balance a see-saw. To achieve a good print I sometimes have to select individual areas of the image and shift the color within that area to ensure a print match. I now have two finished files for the same image -- one which is correct on the screen and one which looks wrong on the screen but is used to print the image so it matches the one on the screen. In addition, I must always remember that the goal is a fine print, not necessarily a print faithful to the screen image. What works on the screen does not always work as well when printed --so occasionally I continue to make adjustments purely in reference to the print itself. Another necessity is that I have to ensure consistency, print after print. Each of my images is offered in a numbered edition. Number 50 must look like number 25 which must look like number 1. This process of profiling ensures consistent results. The procedures recounted here are known as "color management."